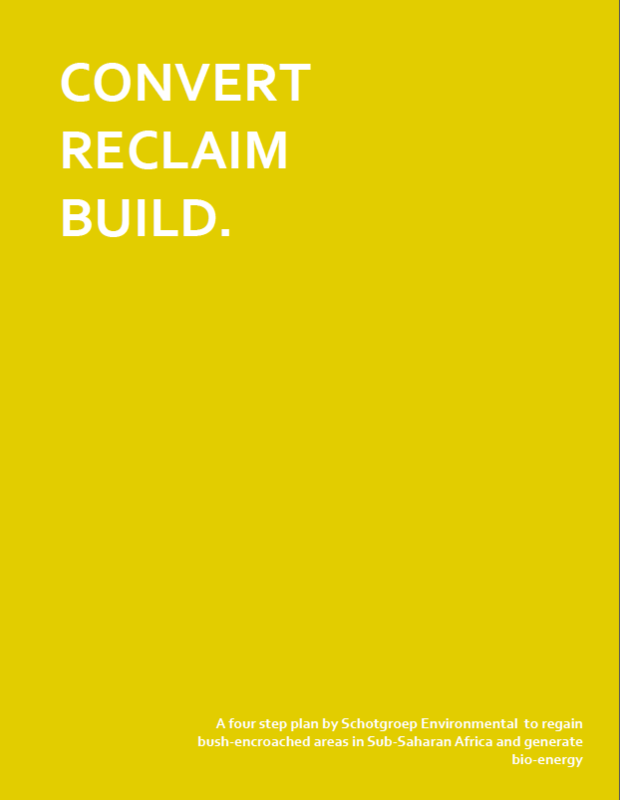 Voor Schotgroep Environmental schreef ik het document Convert Reclaim Rebuild. Een document dat werd gepresenteerd aan de Verenigde Naties, de grootste investeringsbank van Afrika en andere potentiële investeerders. Hieronder staat de overview en de inleiding. Mijn opdrachtgever en ik begonnen vanuit het niets, er was nog niets op papier gezet, geen stappenplan, geen vastomlijnde doelen, geen inkleuring van de zogenaamde Sustainable Development Goals. Alles wat je hier ziet, is nieuw. Mede daarom was dit project een van mijn favoriete projecten in mijn loopbaan tot nu toe. Marie-Claire Dangerfield deed de eindredactie tekst. Saskia Wigbold verzorgde de illustraties in de vorm infographic-collages. Ik deed zelf de vormgeving. Als je het hele rapport wilt inzien, neem dan contact met mij op. 300 million hectres of arable land are being affected by the invasion and/or thickening of aggressive undesired brushwood (‘invasive bush’), in an effect known as bush encroachment. The consequences of this bush encroachment are devastating. Both biodiversity and yearly agricultural yields and suffer drastically while simultaneously desertification by erosion and a lowering water table is on the increase. Precious grazing grounds and farmlands have become useless and barren, threatening the food production and economy resource of a steadily growing population. Sub-Saharan Africa – with a high demand for agriculture – suffers te most of this ecological problem. Poverty, mass migration and hunger are consequences that can be addressed to this relatively unknown ecological disaster. Schotgroep Environmental, in cooperation with Torrgas and Rumptstad Africa, developed an innovative plan to regain land in bush encroachment affected areas by regarding invasive brushwood as a profitable feedstock for clean and sustainable energy production. By implementing this, we are paving the way for the long-term agricultural and economic redevelopment of the affected areas. • remove invasive brushwood and reclaim farmland for livestock and crop production • convert brushwood into bioenergy, providing agricultural business and inhabitants a valuable energy and export product while increasing the agricultura l viability of newly reclaimed lands • combat desertification by the removal of invasive bush • Creating jobs – the opportunities for job creation are manifold, not only in the agricultura and construction sector, but also in educating local workforce, and establishing a sustainable agricultural infrastructure for the future. And subsequently: • set up a resilient and efficient road network, depending on economical and social demands of the local community • raise water table via the removal of invasive bush by stopping the high level of water retraction due to encroaching plantlife • create a smart production cycle, leading to a sustainable consumption pattern with minimum waste. These objectives correspond closely to the General Assembly of the United Nations 2030 Agenda for Sustainable Development. More specifically the sustainable development goals number 1 (end poverty), 2 (food security), 7 (energy security), 8 (economic growth), 13, (climate action) and 15 (combat desertification) – which will lead to the fulfilment of, secondly, goal 6 (sustainable management of water) and 12 (sustainable production patterns). This project also reflects the principles for responsible investment in agriculture and food systems, as endorsed by The Committee on World Food Security (CFS) and the African Progress Report 2015, Power People Planet, set up by the African Progress Panel under the lead of Kofi Annan. Schotgroep Environmental developed a harvester that is able to harvest the brushwood without causing desertification and that can withstand both the sturdiness of the brushwoods and the roughness of the terrain and climate in Sub-Saharan Africa. This machine converts the harvested brushwood into wood chips, which can be easily stored or transported to a decentral bio-energy plant. The harvested brushwood chips will be converted into a valuable energy product, a process invented by our partner Torrgas. Torrgas is the first company in the world that successfully proved the conversion of African bush chips into sustainable syngas. Because this syngas is free from tar and nitrogen, it serves as an ideal replacement for natural (fossil) gas, to create heat, power and feedstock for production of base chemicals like methanol and ammonia. By setting up a small decentral plant, farms and nearby towns can be supplied with this sustainable bio-energy. The byproduct ‘biochar’ is emission free. It can be used locally as water purifier, fertiliser and clean cooking fuel in the form of bio-briquettes, or as valuable export product: biochar also functions as an excellent sulfur free petcoke replacement or as metallurgical coke. Schotgroep Environmental designed two long-term agricultural schemes. The first scheme is based on livestock for meat and dairy production and the regrowth of brushwood within a four to seven year period for bio-energy production. Every year, a different section of the land will be harvested and used as feedstock for the energy plant. The previously harvested areas are used as grassland for livestock-based agriculture, on a rotating basis. After four to seven year (depending on brushwood type) the invasive bush will have regrown and will then be harvested and used as new feedstock for the energy plant. The second scheme is based on crop production. For crop production, the roots of the invasive bush will be permanently removed over a two year period, in order to avoid excess erosion of topsoil. The reclaimed land can be used for carefully long-term crop production. education plan that aims to set up a long-term productive and sustainable agriculture scheme with local workforce, with an aim to create productive and sustainable farmlands and an economically independent po pulation. This model is not based on charitable handouts. The objective is to set up an independent, long-term sustainable economy, driven by its participants. This view requires the stakeholders to search for rational and smart options and solutions with a long-term lifespan. Only by cooperation with other parties and employment of the local workforce, we can reach our mutual goal: an economically sound and socially strong, sustainable environment. not seen such a bold and definitive plan to stop climate change, poverty and pollution. These plans provide much needed support and structure to many areas in need. Regarding the current issues in African countries, the World Bank has declared 32 of the 48 nations on the continent to be in energy crisis. Energy development has not kept pace with the rising population and demand in developing regions, placing a large strain on the continent’s existing resources over the first decade of the new century. Another rapidly growing problem is looming on the horizon. A problem that not only affects Africa, but all corners of the world, threatening both our current, and future generations: climate change, caused by the emissions of greenhouse gases, most notably carbon dioxide (CO2), is disrupting the ecosystem worldwide. Our solution closely corresponds with the vision of this report. We found the core of our answer to the global question how to reverse the spiral in conversion: by turning invasive brushwood into bio-energy and starting a agricultural development scheme, a problem can be converted into a solution. Our plan soun ds ambitious, and it is ambitious. 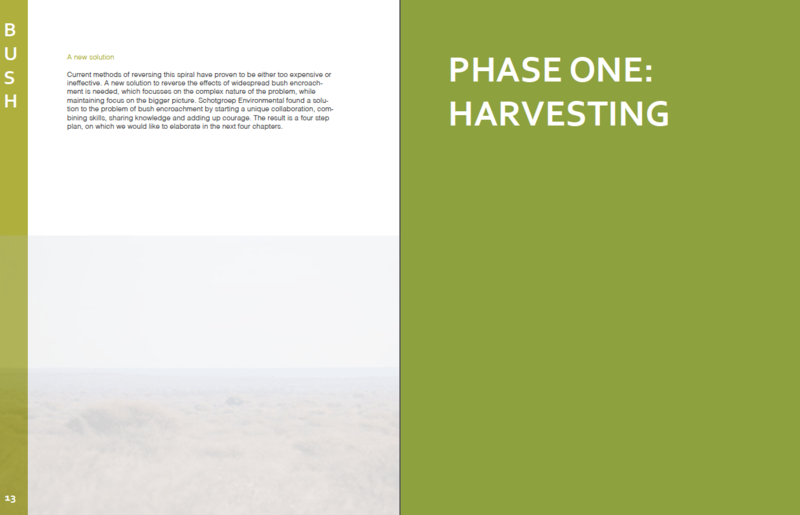 We believe that only an ambitious plan is the right approach to questions such as how to stop bush encroachment, create access to green, produce affordable energy and lower CO2 emissions. Through this document we would like to introduce you to our innovations, our methods and above all: our courage to think in solutions. Not only world leaders, NGOs and global public entities want to make a change.